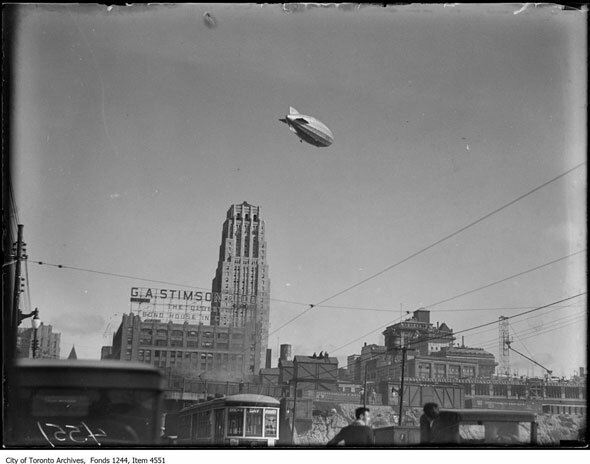 In the late summer of 1930 the people of Toronto saw something over the city not many could claim to have seen before. 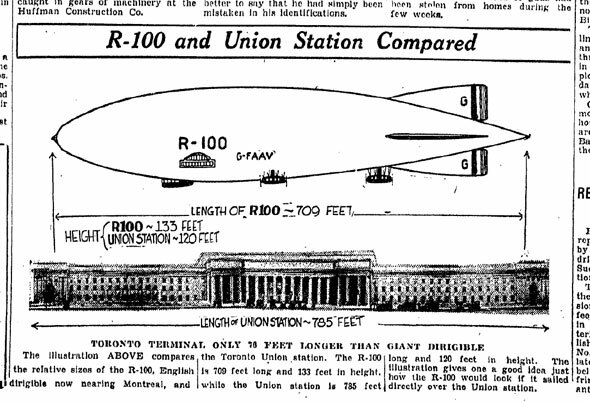 Humming like a giant insect, the dirigible R100 - an airship almost as long as Union Station - circled over the heads of thousands. Work stopped, traffic ground to a halt, and rooftops were packed as everyone strained to glimpse the pride of Great Britain. It wouldn't stick around long, but the visit of the R100 represented a major milestone for Canada. 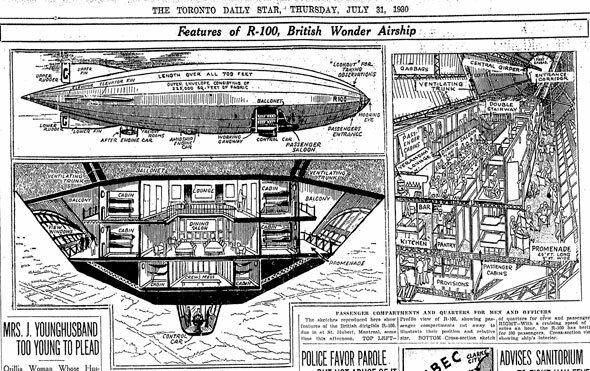 It was the largest flying machine ever to visit Toronto, and one of the largest aircraft of any type in the world to date. Just months later, however, it was broken up for scrap in the wake of the terrible crash of its sister ship in France. Toronto had never seen anything like it. In the mid 1920s Britain was mired in a deep depression. The first world war had taken its financial toll and new technology was needed to kickstart a fresh period of growth. The British Empire was at its height but transport technology still prevented rapid links between its major centres. It was at this time that dirigibles - large helium or hydrogen airships steered by gasoline engines - began to take shape as a viable means of transportation. The German, French, and Italian armies had used zeppelins as bombers during the war and the colossal vessels had the potential to be long-distance passenger carriers provided they could be operated safely. 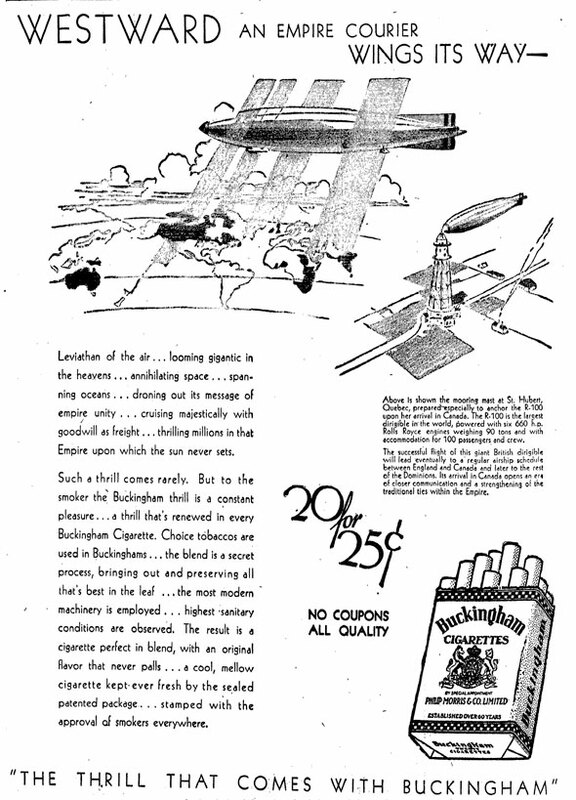 1920's airplanes were small, cramped, and capable of only short flights. Dirigibles, by comparison, had the potential to fly for days without stopping for fuel. With this thought in mind, the UK government launched its Imperial Airship Scheme. Two vessels were to be built, one by a private company and another by the country's own engineers, to similar specifications. They were the R100 and R101, respectively. The R100 was the first to be finished in Howden, Yorkshire in 1929. The airframe was made of duralumin, an early aluminum alloy, and covered with a giant 5-acre fabric coating stitched together in pieces and stretched into place. Inside the cavernous 146,000 cubic metre shell, 17 gas bags made from oxen intestines provided the all-important buoyancy. The bags were filled with a combined 500 million cubic feet of ultra-flammable hydrogen. The United States had a monopoly on helium, another lighter-than-air gas, and it wasn't available in the qualitities the UK required for their airship program. 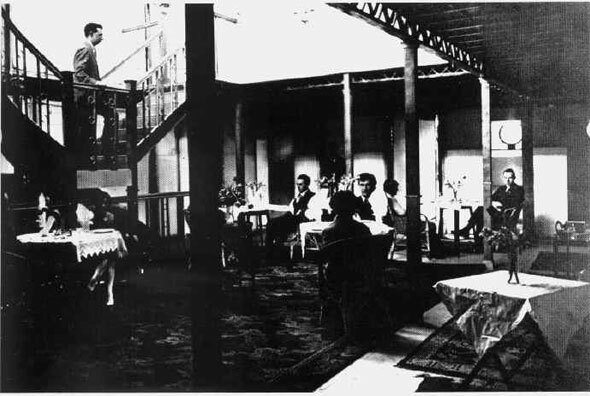 Olympic ocean liner watched over the comfort of every guest.There were guest rooms with portholes and balconies, a 30-seater dining room, a saloon, a kitchen, a 40-foot wide promenade deck, a lounge, and a grand double staircase all awaiting the green light for full-scale passenger service. 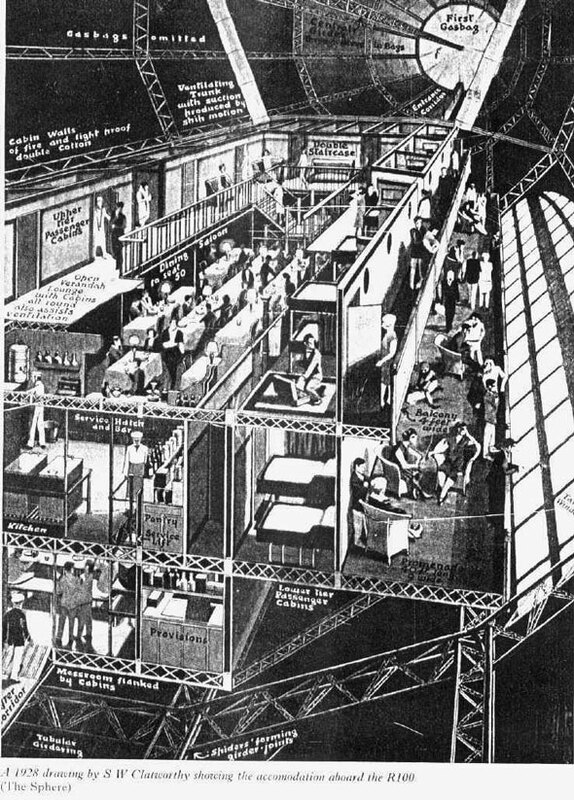 Perhaps most amazingly, the R101 even featured a smoking room despite the massive risk of a catastrophic explosion from even the smallest unconfined fire. 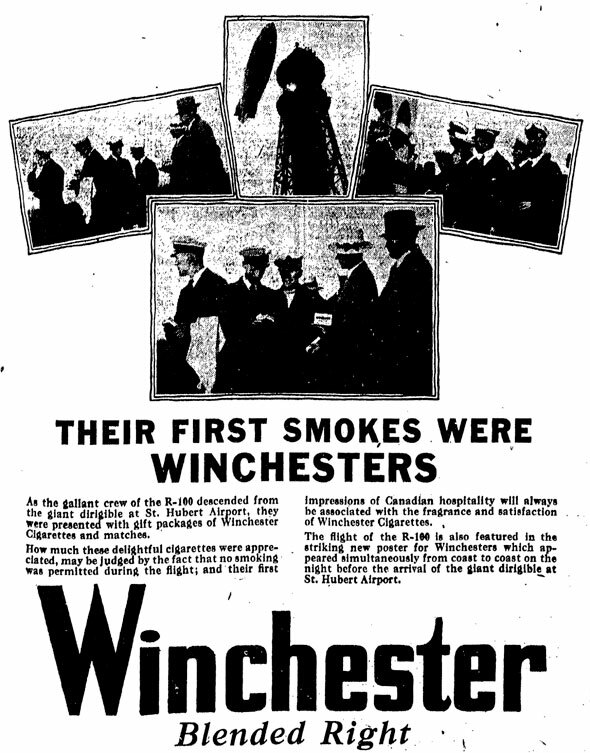 Smoking was strictly prohibited on the ship that visited Toronto, however. 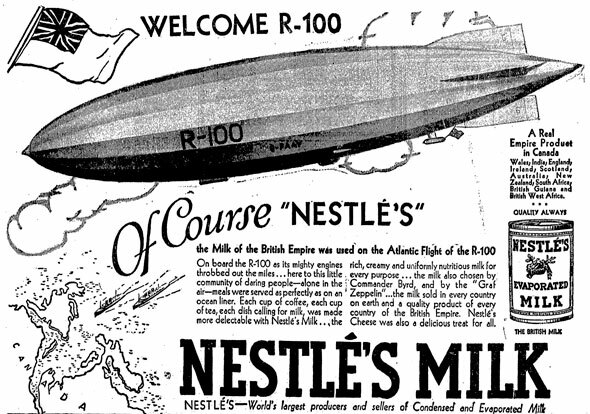 The Imperial Airship Scheme's first major test was an Atlantic crossing to be made by the R100. 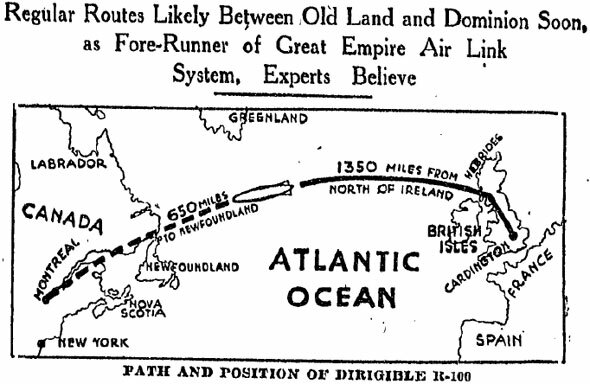 The dirigible was supposed to take its first long-distance trip to India, but concerns over the effects of humidity in the region lead officials to prove their design with a visit to North America. Naturally, giant hydrogen-filled blimps like the R100 typically didn't fare to well in inclement weather. To help the ship avoid dangerous storms the flight deck was equipped with machines capable of receiving transmissions of the latest weather maps from London. With an estimated top speed of just over 100 km/h, it didn't have the ability to outrun fast-moving weather for long. 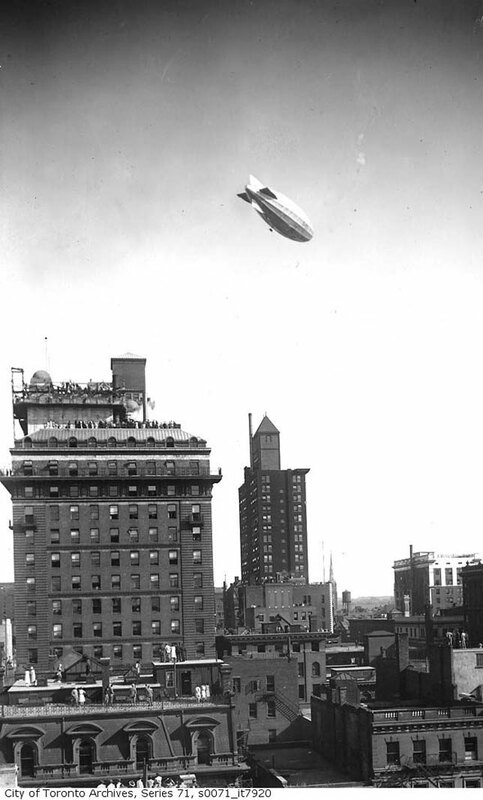 To illustrate the maneuvering problems experienced by the pilots, the R101 airship was praised during early trials for dipping its nose in salute to England's King George V midway through a ceremonial flyover, but in fact the engineers were struggling to control the vessel and had to work feverishly to keep the nose level during almost every flight. 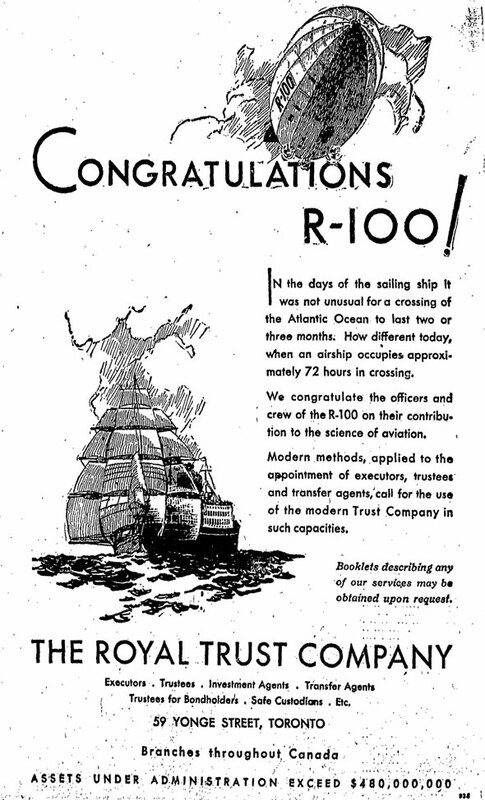 The R100 departed for Canada on Monday July 28, 1930, at 9:45 in the evening. It made its way northwest from its hangar at Cardington, England, and passed over the northern tip of Ireland in the early hours of the next morning. 42 engineers, officers, and crew were aboard but only two passengers made the maiden trip. The first and only stop would be a purpose built tethering mast 12 miles outside of Montreal at St. Hubert, Que. There, 250,000 excited spectators were expected to greet the ship amid a media frenzy. The CBC called in Foster Hewitt, a man famous for his sign-on that still graces the intro to Hockey Night in Canada, to host the live radio broadcast. 200 other writers and photographers were expected to pack the airfield. In response, 300 soldiers, provincial police, and RCMP officers were called in for crowd control. 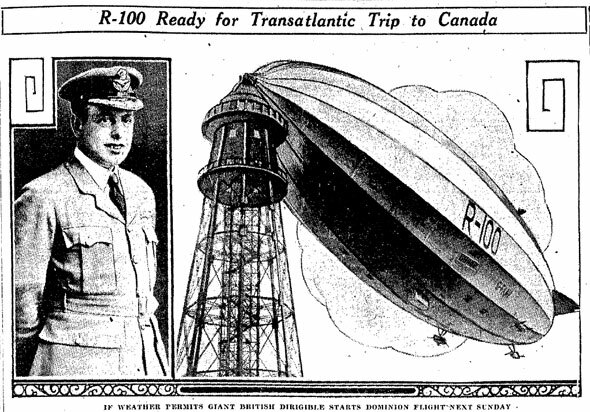 The commotion was so great that it inspired La Bolduc, a folk singer considered to be one of Quebec's first singer/songwriters, to write "Toujours L'R-100" about the airship's arrival. It was imperative the R100 be given a wide berth in Montreal, especially as it was difficult to control and had the potential to explode in spectacular and devastating fashion. 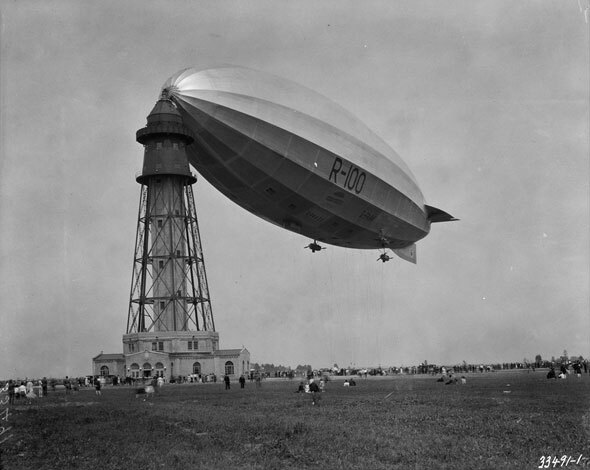 A strict no-fly zone was established three miles around the airship and authorities on the ground were told to keep crowds strictly behind established barriers until it was safe. Toronto Star called the spectacle "one of the biggest news events in recent years in America. 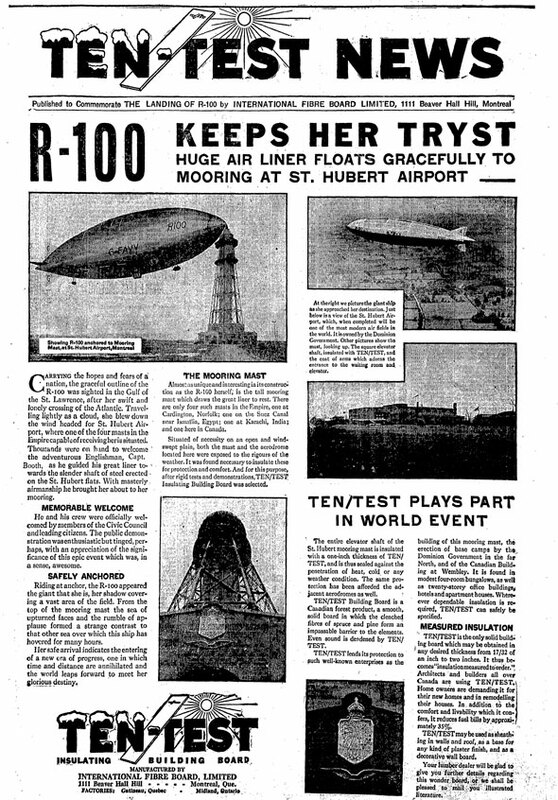 "When the R100 docked safely in the early morning of Friday August 1, 1930, the crew were instant celebrities. 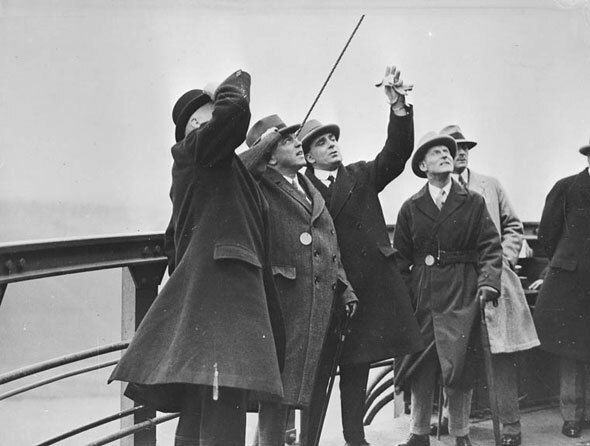 The mayor of Montreal and other government officials were on hand to greet the Englishmen as they disembarked for the first time after their 5-day voyage. Wing Commander R. B. B. Colmore, a man "who ordinarily smokes 50 cigarettes per day," was finally allowed to light up, though he was reported rather cranky when the press pounced. The highlight of the trip according to the crew, was a hair-raising moment in an active storm over the St. Lawrence River. The ship rose to try and clear a thunderhead but struck an air pocket and plunged over 2,000 feet "in as many seconds." "Everybody was holding on to some part of the ship's structure," recalled an anonymous crew member (interviews were officially forbidden.) "There was a rattling of furniture and crockery all over the ship that overruled all other sounds" before it eventually righted itself. The airship stayed in Quebec for 11 days for press tours and minor repairs. One of the fins at the back of the R100 was damaged as it passed through the storm and there was brief panic when it was reported the ship might not be able to visit Toronto as a result. During its crossing it had burned more than 9,440 gallons of gasoline. Then, with its bodywork repaired, the R100 appeared on the horizon east of Toronto "like a vast nocturnal moth" in the early morning hours of Monday August 11 while much of the city was still asleep. The vessel droned overhead, waking many, and headed down to Niagara Falls before turning and returning for a second pass via Hamilton. This time the city was ready. Star reported.Traffic stopped in the streets and a "mass of humanity" was at the waterfront as the R100 passed over the Toronto Islands. Commander Booth ordered the nose of the craft dipped in salute, apparently intentionally, as it hummed its way back to the centre of the city. "At one time she held her downward path toward the surface of the lake for so long that the crowd was audibly gasping, thinking the mighty giant had met with engine trouble or other difficulty and was being forced down into the water," one journalist wrote. "As she righted herself, pointed her nose upward, and soared off to the centre of the city a mighty cheer went up." 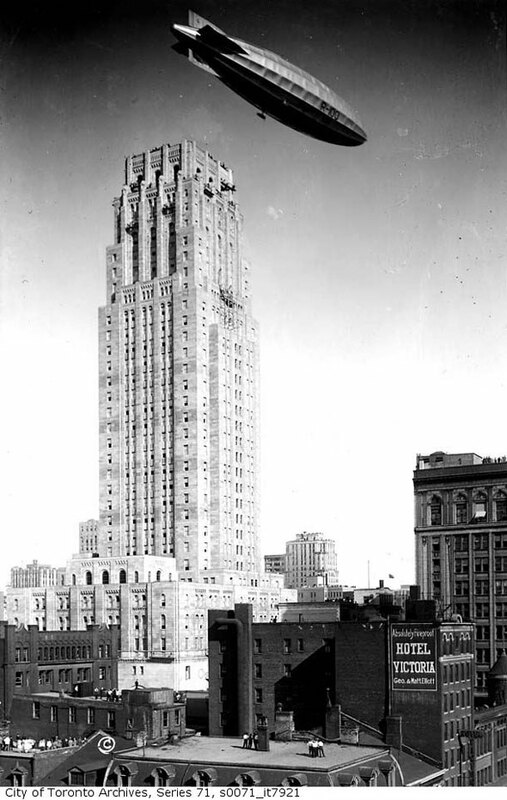 The Canadian Bank of Commerce, then the tallest building in the British Empire, provided a perfect backdrop to this advert for British crown. On the ship, the crew were close enough to be seen waving to the well-wishers on the ground and in their perches. Star with just a touch of hyperbole.The R100 safely returned to its base in the United Kingdom but shortly after its arrival its sister ship, crashed and exploded en route to India after being caught in a downdraught at Beauvais Ridge in France, killing 48 of the 54 passengers and crew. It was the biggest peacetime accident since the sinking of the Titanic. The tragic death of so many promising young engineers and crew shocked the Britain and ultimately lead to the end of the Imperial Airship Scheme. The bodies were buried with full military honours at Cardington and the R100 was broken up for scrap. It would be decades before any passengers would have the chance to fly across the Atlantic again. 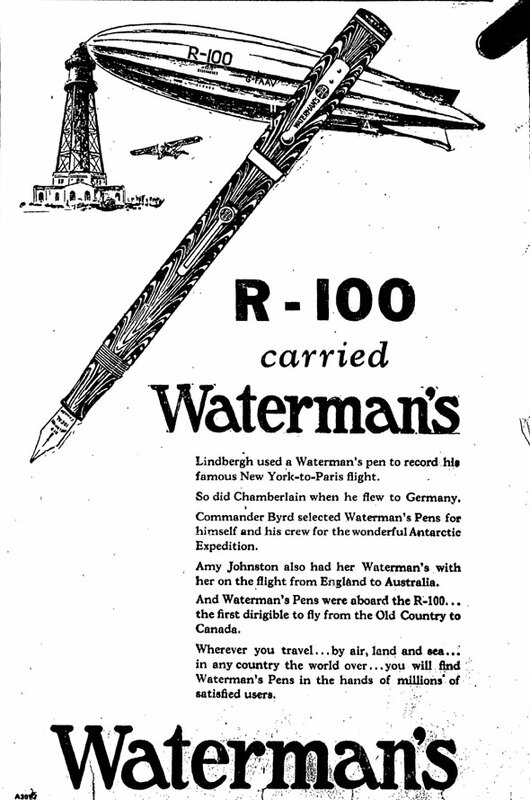 and other papers in the days after the visit of the R100. Here are some of the best. 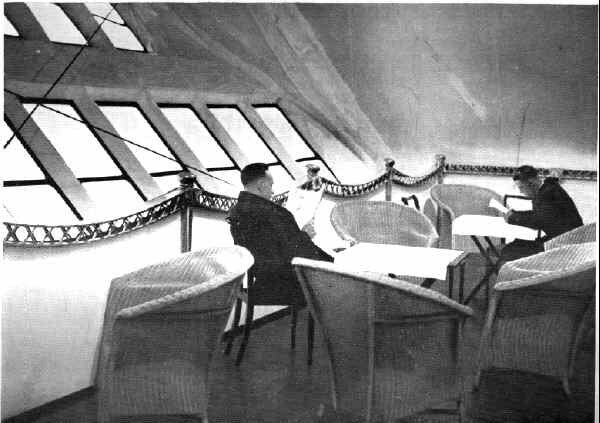 Inside the airship: the promenade deck. The lounge room aboard the R100. Prime Minister William Lyon Mackenzie King (second from left) inspects the R100 at St. Hubert. 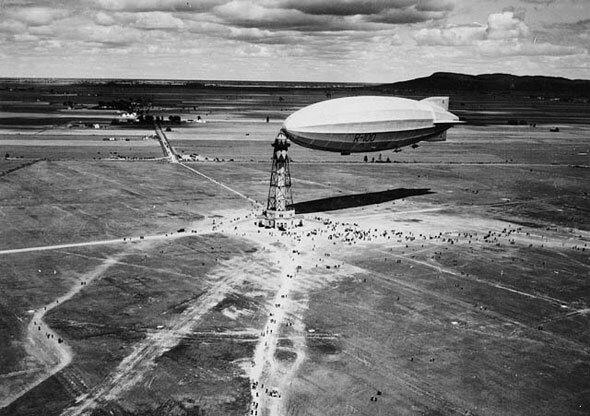 The view from the ground of the airship tethered to its mast in the days after its arrival. 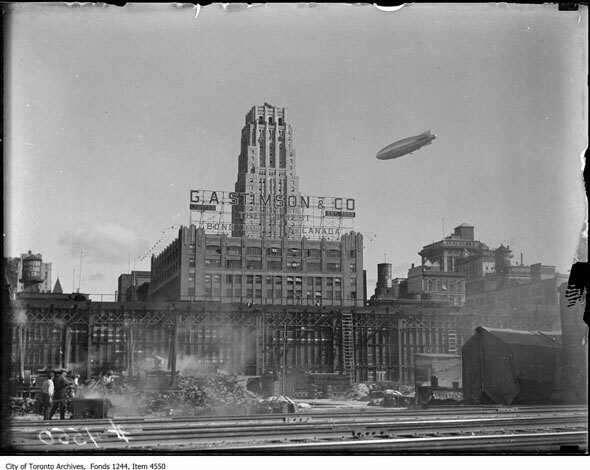 Image: Public Domain, City of Toronto Archives, /blogTO Flickr pool.